Senior Care in Hazlet NJ: What Are Risk Factors for Deep Vein Thrombosis? What Are Risk Factors for Deep Vein Thrombosis? March is Deep Vein Thrombosis Awareness Month. 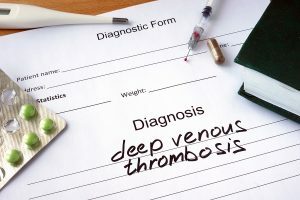 Each year throughout the United States more than 600,000 people experience deep vein thrombosis or pulmonary embolism, and more deaths are caused by these issues than either AIDS or breast cancer. As a family caregiver it is critical that you understand the risk factors associated with this potentially devastating disorder so that you can ensure that your elderly loved one gets the level of care, support, and assistance that they need to reduce the chances that they will develop a blood clot, and to effectively and efficiently manage a clot should it occur during the course of your parent’s later years. If you feel that your aging parent is at increased risk of suffering a blood clot, get in touch with their doctor to discuss these risks and what you can do as their family caregiver to help reduce the risk and protect your aging parent from deep vein thrombosis and the devastating consequences of such a condition. If your elderly loved one has recently suffered deep vein thrombosis or is at increased risk of such a medical condition due to their other health complications and issues, how may be the ideal time for you to consider starting senior care for them. A senior home care services provider can be with your aging loved one on a fully customizable schedule that is right not just for your parent’s needs, but also the type of care that you give them. This means that your loved one will get the support, care, and assistance that they need to handle these risks, heal and recover effectively, and work toward prevention of another serious incident in the future. When it comes to protecting your aging parent from deep vein thrombosis, this care provider can help your parent to understand the specific risk factors that they face and how they can effectively address those factors in their daily life. They can then create a personalized course of care and management designed to reduce their risk, help them to remain compliant with the medications and guidelines set forth by their doctor, and support a more active, fulfilling, and independent lifestyle as they age in place. If you or an aging loved one are considering elderly care in Matawan NJ, please contact the caring staff at Lares Home Care 888-492-3538 or 732-566-1112.